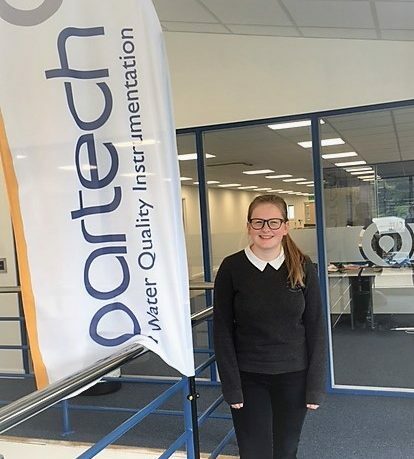 Every year we offer the chance for students to undergo work experience at Partech. This year we were joined by Katie Coad from Penrice Academy. Katie primarily assisted the Design Team with testing and calibrating instruments. She also helped out in the Sales, Admin and Finance Departments and was a pleasure to have on board! ” On my first day at Partech I did feel a bit nervous, but I was soon greeted by very friendly staff and I no longer felt worried. I spent the week testing and calibrating Water Quality Sensors and looking at how instruments are designed on the computer using different software. I also helped with some of the admin work, archiving and scanning documents. I feel like I have learnt quite a lot and it was a really good week at Partech. I found it a really interesting company and it was exciting to see what it would be like to work there. I’d like to thank all the staff for making it enjoyable and looking after me”. Thank you for all your hard work Katie!